I hated dealing with maligar and yet you never see anyone selling their mystical bongos although it would save so much hassle especially if you weren't in a guild or didn't have enough points or priority or whatever to get guildmates to help you with maligar. Heck it's almost worth just saving the hassle of all that running around to get serra's doll or if your kos to sola gnomes and can't even do the stuff needed to get maligar's enraged doppleganger to spawn. 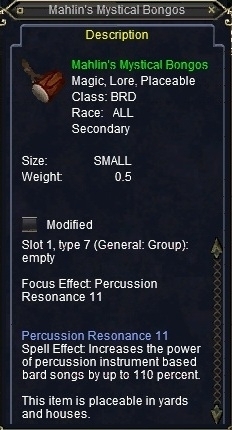 Also, FYI last time I tested the mod on these they gave the same mod (to resists using elemental rythms) as mistmoore battledrums so I'm not sure if this 110% is accurate although there are a lot of better drums out there so using these as your instrument is probably not what most bards will do. RE: never see this MQ'd? You get a page of the symphony from the same turn-in as you get the bongos from; so it would not work to MQ this. However, the page of the symphony you get IS MQable, the final turn in is all at once, not a combine container or anything.